08.07.06 This is the first in a series of reports from the Susan Polgar National Invitational tournament in Oak Brook, Illinois. Maine representative Margaret Bryan shares with us her thoughts at the outset of the tournament and annotates her first round game vs Emily Chu (1536). 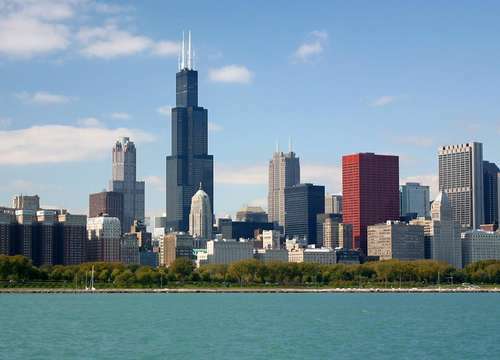 The Sears Tower dominates the Chicago skyline. Well, it’Äôs my second full day in the western suburbs of Chicago. The first round took place at 11:00 A.M. this morning and I have only just taken up my pen to write about it and my other experiences so far. The first thing you should know about Chicago is the following statement; it is one of the most beautiful cities that has ever, and will ever, be created on this earth. I am not actually located downtown; the tournament is being held at the Doubletree Hotel, about 17 miles west of the heart of this ’Äúthriving crop in America’Äôs garden,’Äù but the few tastes I have had of its economic marvel is as delicious as the most gourmet of delicacies. Well, I suppose most people visiting this website have come for chess purposes only, and are not very interested in a lengthy and repetitive description rich with praise of the urban Midwest. Don’Äôt worry, I’Äôm breaking off of my tangent and getting into the opening ceremony right now. The Denker/Polgar reception was held at 9:00 A.M. The Denker tournament (named after the late grandmaster Arnold Denker) is a tournament meant solely for the high school champion from every state. Sadly, Maine did not have a representative this year, but I was told specifically by the tournament host to affirm that next year Maine would be well-represented in both the Denker and Polgar tournaments. Then there was the Susan Polgar National Invitational for Girls, the tournament that I am participating in. It is designed to have the top female scholastic player in each state come compete, and I was honored to become the first Maine representative ever in this prestigious tournament. The reception was held in the Spring Room, a relatively large area of modern formality, but was found to be positively minute when the officials attempted to fit 250+ individuals in a room that was accustomed to comfortably containing little over a hundred. The tournament host recognized a large handful of well-known names, and many of them came to the podium to say a few words. At last, Susan Polgar’Äôs name was called, and the legendary grandmaster glibly delivered an eloquently concise speech that was met with a resounding chorus of honest applause. Participants were presented with medallions, bracelets, magazines, and rookie cards of the well-known players in their prime, and after numerous photographs were taken and those holding their cameras were satisfied, we were left to spend what was probably meant to be a leisurely half hour in which we would calmly prepare for our next round. On the contrary, it resulted in thirty minutes of unbearable tension and rigid nerves, while the players anxiously waited for the fateful four digits of 11:00 to appear on their digital clocks. To view this game with our interactive game viewer while following Margaret's annotations, right-click on the hyperlink below and choose "Open in New Window". The Scandinavian, or center-counter defense. I often like to play this when given the black pieces. Until now, we were playing strictly by the book. Now things start to get a little more ’Äúimaginative’Äù. Hugely unorthodox, but I didn’Äôt think it was that bad a move, as I was trying to get her central control off the board. Now I find myself threatened by checkmate, and the only way I can protect myself is to lose a pawn in the process. At the time I thought that my only choice was to go on the offensive attack, but now, on reflection, I wonder if I should have tried to build my defensive forces. Crazy move. I was hoping that, at best, White would make a blunder and capture the free pawn, and, as a result, lose a bishop. Or, if she didn’Äôt, I would have better center control. I noticed the minor threat posed by the light-squared bishop in checking the king, and was hoping she wouldn’Äôt move there, but other than that I wasn’Äôt that worried about it. Major blunder! Why, oh why didn’Äôt I interpose with the bishop?! I guess I just wasn’Äôt thinking. Now I have no choice but to trade queens, and White is up another pawn. And just like that, White is closing in with the minor pieces, and is poised to create pins right and left. At this point I considered capturing the c-pawn, but decided against it in the end, weary of the pin posed by one of White’Äôs rooks on e1. White continues, unmercifully, to pin all of my pieces. This is a last, desperate effort by now. The only good news I can find is that, according to the clock, I’Äôm half an hour ahead, and now I’Äôm just playing for time. I resigned. White’Äôs driving me into a corner, and I am at least about to lose my bishop, if not my rook also. I just wanted to say how much I appreciate seeing a nationwide chess event like this from Margaret's perspective. Here's hoping more Mainers get to play chess in faraway places, and here's hoping they all send reports to Chessmaine!